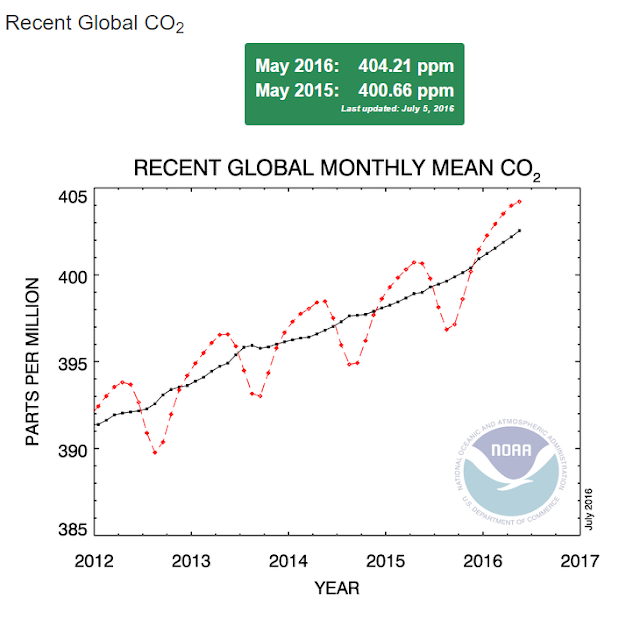 On July 5th, NOAA ESRL released its initial May, 2016 global CO2 averages - a new record of 404.21 ppm and likely the peak monthly average for 2016. While March 2015, was the first global month above 400 ppm, all of 2016 has been above that average. We are on track for our first year above 400 ppm in human history. While NOAA ESRL's graph above portrays the recent monthly trend, it helps to visualize the whole increase since 1980. 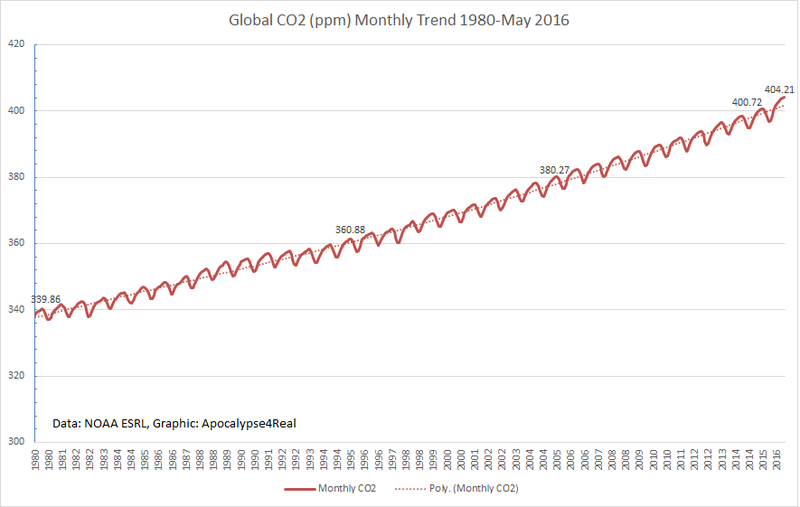 Since May, 1980's 340.30 ppm, we have added 64 ppm of CO2 to the global atmosphere - an increase of 18.8% in 36 years. If a pre-industrial CO2 level of 270 ppm is assumed, then since the 1880's we now have almost 50% more CO2 in our atmosphere - pushing global warming. But what about the trends - are the increases slowing down since, since it has been argued that human emissions peaked in 2014, and were tentatively expected to have a slight decline in 2015, as reported in Inside Climate News and Nature Climate Change in December, 2015? According to the NOAA ESRL data, that is not apparent. 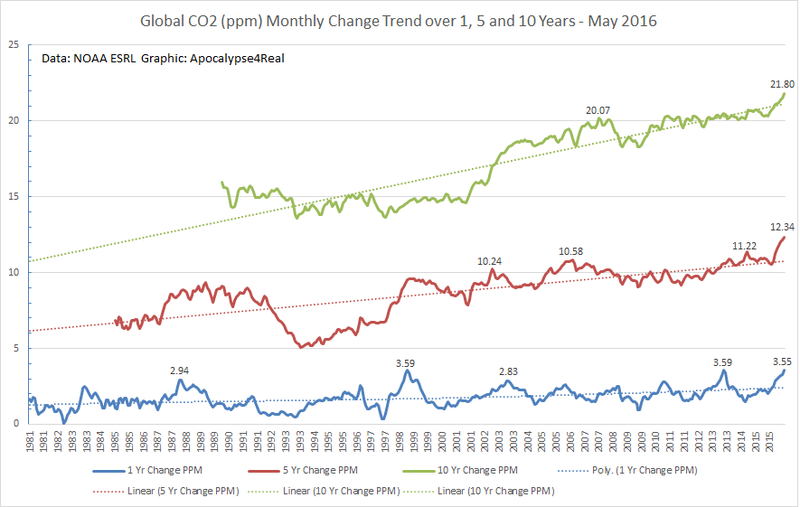 Usually we discuss increases or declines in atmospheric CO2 ppm compared to the prior year. 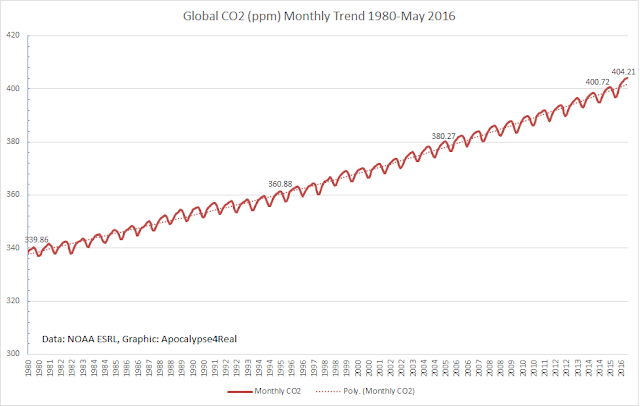 For example, this month's 404.21 is 3.55 ppm higher than May, 2015. It is the 3rd highest difference compared to prior years in the NOAA ESRL global data. The two months with higher change are July, 2013, and September, 1998, which were both 3.59 ppm higher than their prior year. The problem is that comparing only year to year change misses the overall acceleration of atmospheric CO2 increases. To depict that acceleration, the graphic below includes the 5 year and 10 year change in CO2. The longer time frames depict the cumulative effects of CO2 increases. 1 Year: A small trend increase is detectable in the 1 year monthly comparison, from 1981 to present, (blue line above). Peaks have occurred in association with oceanic warming or El Ninos plus reflect increases in human emissions. 5 Years: The five year monthly comparison trend (red line) shows that we have experienced a spike of 12.34 ppm compared to May, 2011. We have now experienced 6 months of 5 year trend comparison above 11 ppm, a new record, and we had never experienced increases of more than 12 ppm in the 5 year trend increases until this year. 10 years: The decadal comparisons reveal the monthly change trends that have occurred since 2000 in sobering clarity. Prior to 2000, most decadal differences were around 15 ppm. But beginning in August 2002, we experienced 21 consecutive months of decadal differences above 2 ppm. That, in combination with higher CO2 increases during the 1998 El Nino, set the base for the jump to decadal changes of 20 ppm, first achieved in September, 2007. Since October, 2012, we have not experienced a decadal monthly CO2 difference under 20 ppm. In December, 2015, we broke through 21 ppm of change. Since then, we have not had a decadal monthly difference under 21 ppm. This month's 21.80 ppm difference compared to May, 2006, reflects the impacts of El Nino, fires, drought, and perhaps climate feedbacks unleashed by the current heating. Will it hit 22 ppm decadal difference this year? Not likely, but only time will tell.